Everything that occurs in space-time is part of a field. 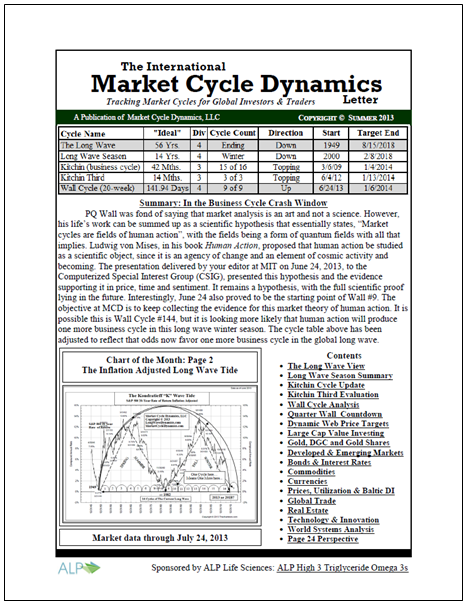 Market Cycle Dynamics, LLC has developed a Market Cycle Dynamics (MCD) price, time and sentiment field theory approach to stock market cycle analysis as a formula timing plan, as advised by the great value investor Benjamin Graham in The Intelligent Investor. The basic purpose of the approach is to identify high probability cycle lows and highs for entry and exit of global franchise large capitalization companies. Human action includes the big and little actions we all take every day. This includes the very big decisions of the members of the Federal Reserve Board, European Central Bank, or the Peoples Bank of China, such as interest rate policy, or the daily trading of a billion dollar hedge fund manager. It also includes relatively small decisions, like the car you drive, and even what you had for lunch today. Human action includes all the investment decisions made by large and small investors and traders. All these decisions take place in fields of human action that are reflected in the wave function price movements of major market indexes and often most clearly in large capitalization companies. The reflection of these fields of human action in major market indexes isn’t perfect, but clear enough on a chart to produce regular stock market cycles that can be tracked using the right technical market analysis tools. The field theory approach to market cycle analysis suggests that the degrees of freedom in fields of human activity are guided by Fibonacci ratios in price and time. The degrees of freedom represented by Fibonacci ratios have been proven to be present in extensive natural phenomena. Investors have tracked the Fibonacci ratios in stock prices movements for years and the Market Cycle Dynamics approach is the natural next step. The transition between two stock market cycles represents the transition between two fields of human action in time. The practical MCD approach to price, time and sentiment in market cycles will change your view of Fibonacci market analysis and market cycle forecasting forever.